If you’ve got a lot of workers and you’re going places, then the big Polaris Crew is the one for you. It’s big, it’s wide and it is very long, but still one heck of a ride-on ATV that will go almost anywhere off-road. 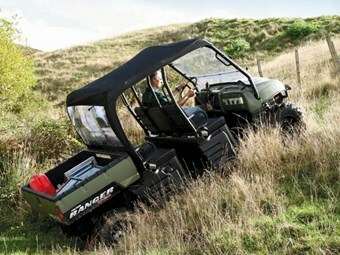 After driving it, I reckon there is just no other ride-on ATV quite like it and, it has been on the market since 2007. 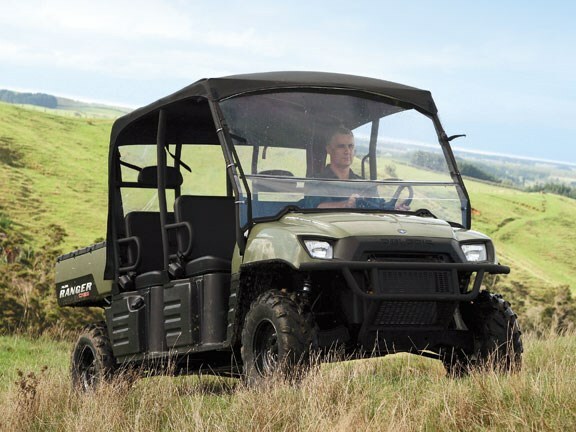 The three seat Ranger ride-on ATV has been on the market for some years now – I tested one of these back in 2004, plus a couple of revamped models since, so I know the Ranger pretty well and what they can do. They are very stable! Polaris has stretched the chassis to make room for an extra row of seats – each position has its own dedicated seat belt. The motor is now located back a row, under the rear seat, leaving a massive waterproof storage compartment under the front bench seat. Another storage box can be found on the opposite side to the 34-litre fuel tank. Driving the Ranger Crew felt a bit like driving a truck, not in weight of course, but I had to make my turns a bit wider so the rear wheels would track in the right places. Helping in that department is the all-round independent suspension set-up. About the only thing you need to be careful about when driving the Ranger Crew is grounding the chassis on a stump or grassy knoll, even with a good 180mm ground clearance. Just like the smaller Ranger, there’s plenty of power to haul a good load about anywhere you’d like. The Ranger Crew has a bigger 40hp 700cc EFI twin cylinder powerplant to help push it along at speeds up to 70kph. With the same four-valve motor as you’ll find on the powerful Sportsman 700, the liquid-cooled engine’s electronic fuel injection system gives greater economy and better performance in either of the 2WD or 4WD options. The chassis specifications are also high, as the Ranger Crew has a maximum 907kg towing weight and a 567kg tipper tray load capacity – about the same specs as you’d find on the three-seat Ranger. In addition, if you carry long items the rear tray quickly folds down parallel to the tray floor. The only thing it’s missing is the engine braking system found on other Polaris ATVs. Coming down the slopes loaded with heavy equipment and a full complement of people points to a lot of responsibility for the driver. To be fair, the brakes are well up to the mark on their own, but I think Polaris should be offering engine braking on this 662kg model first, not last. Same as the latest Big Boss six-wheeler, the new format instrument package includes an analogue speedo in addition to a digital speedo option at the press of a switch instead of having a rev counter, along with a clock, mileage and a handy trip meter. 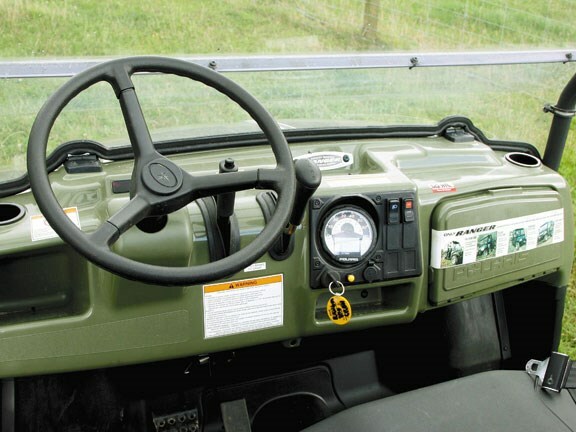 Our test Ranger Crew was fitted with an optional Perspex front window and a two minute to fit cloth rollcage cover to keep the weather out. New Zealand Polaris representative Gary Ridden explains the uniqueness of the Polaris Ranger Crew. "The Ranger Crew is for anyone who needs to carry people around." He says the most popular market is forestry for carrying all the guys in and out of the bush. 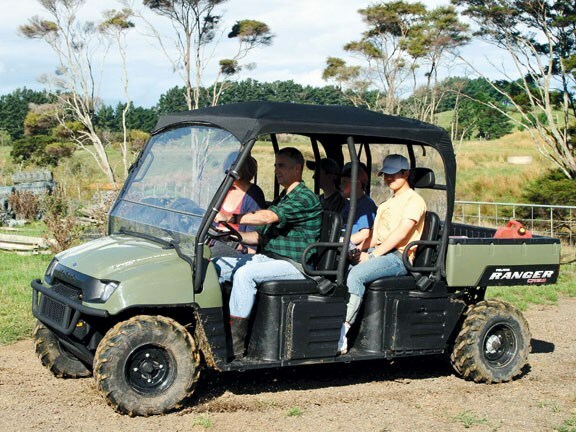 "It’s also useful for anyone carting people around farms and can even be used down at the beach – basically it’s useful whenever you need a safe vehicle that can carry a number of people offroad to places you can’t take a car or ute." See used Polaris ATVs for sale.